Happy Monday! Not only is it time for another Technostamper Monday Lunchtime Sketch Challenge…but I have my Preview Project for Create with Connie and Mary Spring Collection 2014…so much sure you check it out! If you are looking at it on Monday…I’m offering BLOG CANDY!!!! So…on to this card. I can’t say I honestly like the font used in this set…but it can make fun cards…although it feel ‘young’ to me. 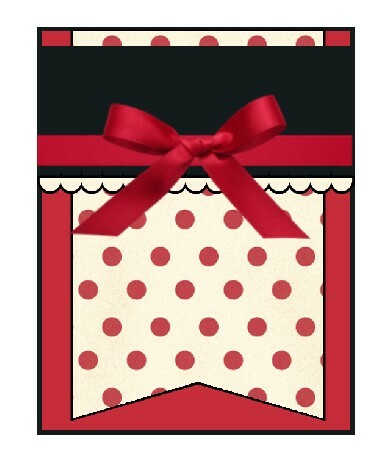 Use Banner Framelit to cut a piece of the Kaleidoscope dsp and add to card front. Basic Black 4 1/4 x 1 3/4. Stamp greeting in Versamark and Gold Emboss. ‘Fussy’ cut the larger multicolored Chevron and add to bottom. Tie piece of Bermuda Bay 1/8″ Taffeta ribbon around panel and add to card front using dimensionals. Yep it really is THAT easy! Isn’t this a fun sketch? I thought so! Don’t forget to check out the other members of the team and remember go to the Technostamper blog to play along! PREVIEW WEEK HAS BEGUN!!! Looking for EXCLUSIVE ideas for products from the Occasions Mini and Sale-a-bration products? 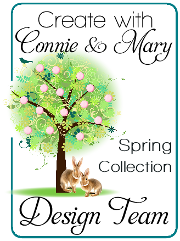 Well…Create with Connie and Mary Spring Collection 2014 is for you! Preview Week where you can get a taste of what Create with Connie and Mary Collections are all about! This entry was posted in Technostamper Challenge and tagged Geometrical. Bookmark the permalink. 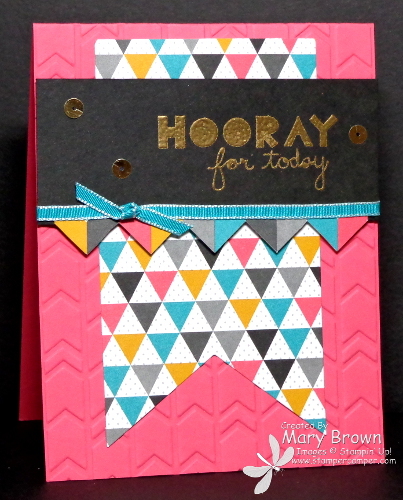 Super fun Mary, love all the geometric shapes. Awesome job using those! Thanks so much for being a part of my TSSC team.